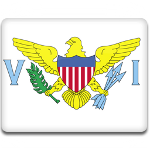 The US Virgin Islands annually celebrate Transfer Day on March 31. This holiday marks the transfer of the islands from Denmark to the USA in 1917. The Virgin Islands are a group of islands in the Caribbean region. The islands geographically belong to the Virgin Islands archipelago. The Danish West Indies bought the island of Saint Croix from France in 1733. The island was sold to the USA only about 200 hundred years later, when it was at the peak of the plantation economy in 1916. The transition of the island took place on January 17, 1917. The United States paid the Danish the sum of 25 million dollars in gold. Before the deal was formalized, two referendums were held in Denmark and in the islands. The Danish voters and islanders both approved the sale. The inhabitants were given the US citizenship. However, the formalities were completed only on March 31 of the same year. When everything was arranged, the island officially became a possession of the United States. The anniversary of this event is known on the US Virgin Islands as Transfer Day.